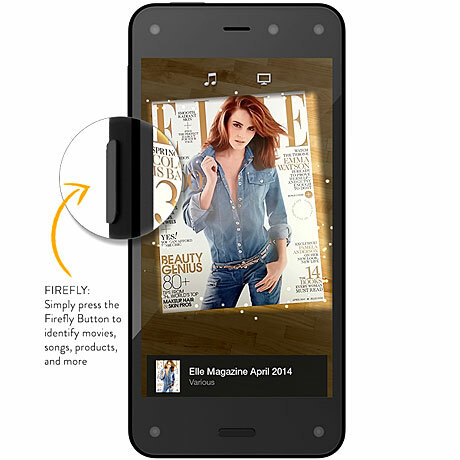 Amazon has launched Fire, a smartphone that includes 3D “dynamic perspective” technology and a dedicated Firefly button that lets users recognize — and buy from Amazon — physical products, movies and music that they come across as they shop, browse and socialize. Fire supports NFC and will support Bluetooth Low Energy (BLE) in the future. Fire owners will be able to use Firefly to scan household items, books, DVDs, CDs and video games and then access product details, add items to their Wish List and purchase the product from Amazon. Firefly can also identify music, movies and TV shows being played and let users instantly order the item. All items scanned using Firefly are also stored in the user’s history so they can be bought at a later time by tapping on the item in the list. “Press and hold the Firefly button, no matter what you are doing, if you are in the middle of a text message, anything you are doing on the phone, press and hold that button, even from the lock screen, even from behind your PIN, and bam, up comes Firefly, the Fireflies get released and they immediately start recognising,” CEO Jeff Bezos explained during Fire’s launch presentation. Third-party developers can use the Firefly SDK to build on top of Firefly, Bezos continued. “They can use our text recognisers, our image recognisers, our audio recognisers and our content databases, those 100 million items, and all they have to do is create a custom action. MyFitnessPal, for example, will provide nutritional information on food a user points at while Vivino will identify wines and provide information on them. StubHub will use Firefly’s song recognition feature “so when customers hear a song in the background they can find out if the band is playing in their area and buy tickets”. Developers will also be able to use the Dynamic Perspective SDK to provide users with 3D renders and effects which can be combined with a tilt and scroll function to provide richer product images and the ability to “see around the corner” of a product, map or game. The technology is delivered via four cameras that each have a 120-degree field of view and combine to create a 3D perspective. The Fire Phone runs Fire OS 3.5.0, Amazon’s tweaked version of Android, and comes with a 4.7-inch screen, quad-core 2.2GHz Snapdragon 800 processor, Adreno 330 graphics, 2GB of RAM and a 13MP rear camera. Pre-orders are being taken from today by AT&T, the exclusive stockist in the US, with prices starting at US$199 on a two-year contract, including a year’s free membership of Amazon Prime. Fire will start shipping on 25 July. • Find details of all current and upcoming NFC phones in our comprehensive NFC devices list.